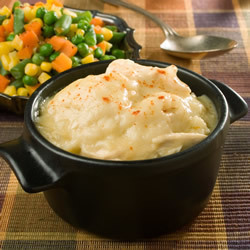 Place chicken, potatoes, carrots and celery into a 6-quart slow cooker. Stir the soup, water, salt and peeper in a small bowl. Pour the soup mixture over the chicken and vegetables. Cover and cook on LOW for 6-8 hours or on HIGH for 3-4 hours, until chicken is cooked through. In a medium bowl, stir the baking mix and milk. Spoon batter over the chicken mixture. Cook on high heat with lid tilted to vent for 30 minutes or until dumplings are cooked in the center.